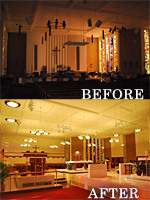 Church Lighting, Fixture Installation and More! A well-lit worship space sets the tone for your services. Church lighting offers subtle cues to your audience, focuses their attention and makes participation and interaction an enjoyable experience for everyone. But church sanctuary lighting has gone way beyond aesthetics in recent years due to increasing concerns about environmental stewardship and overall energy consumption. In response to these growing concerns, new government regulations will be implemented in the near future that will require churches to comply with bans on incandescent lighting as well as observe new rules regarding energy consumption. How will you prepare for the new government regulations and still provide the lighting experience your congregation has come to expect? How will you sort through the choices, the technology and the costs to find the best solution? With the advent of many emerging technologies such as LED lighting, you need an expert on your side to help you sort through your options, make suggestions and help you put a plan together that serves your church today and into the future. At Fredrick & Emily's we've been helping churches improve their sanctuary experience since 1974, so we understand the unique challenges churches face. 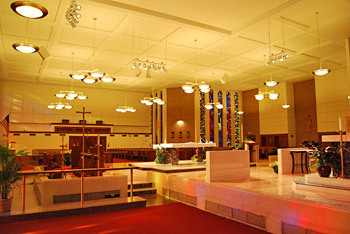 We can design and install an energy-efficient LED church lighting system and lighting fixtures that complies with all the new government regulations, without sacrificing light output, aesthetics or the unique style needs and desires of your place of worship. At the forefront of everything we do is the mindset that this is YOUR church. Virtually eliminate your maintenance costs. You won't have to change a light bulb for the next 30 years! Want to know more? Contact Fredrick & Emily's today for a FREE consultation to discuss your church lighting challenges. Changes to these lights can actually make the church money. In fact many of our clients have seen a 300-500% return on their investment in new lighting! Technologies such as LED church lighting make these savings possible! Ready to see how new church lighting can benefit your church? Contact Fredrick & Emily's today and let us help you increase your savings, provide a safe and legal environment and create an atmosphere designed for worship. 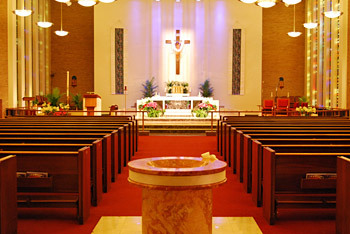 individualized to meet the needs of your church lighting system.